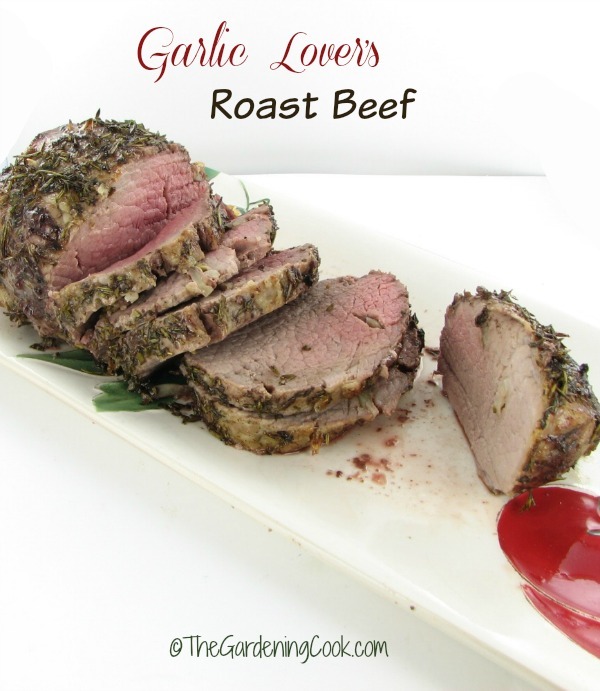 If you love garlic as much as my family does, this recipe for Garlic Lover’s Roast Beef will delight you. Almost every bit if the roast has a bit of garlic in it! 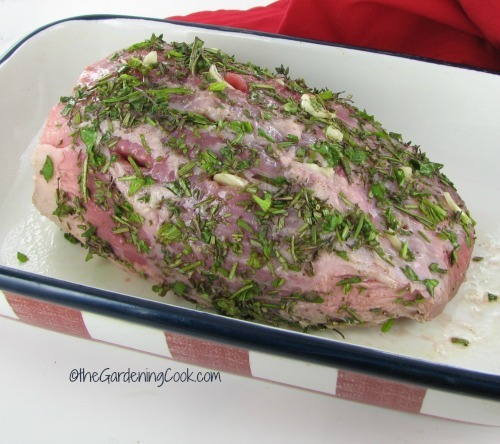 The seasoned crust of the roast beef also adds so much to the recipe. Once you have served it once, you will be making it for all your special family roast dinners. 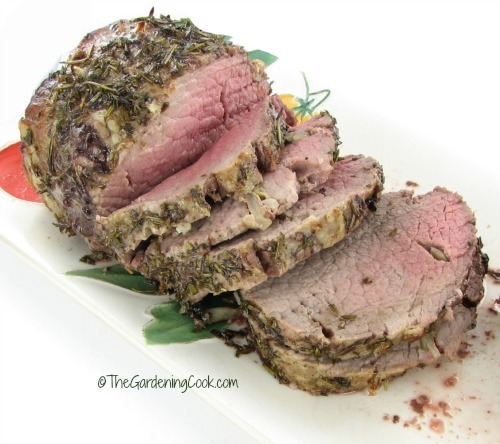 Roast beef is a common menu choice in my home. My husband loves it and it’s really quite an easy dish to make as long as you have a meat thermometer handy. Checking the temperature with one of these handy kitchen gadgets will make sure that the roast comes out exactly the way you like it every time! I recently had the opportunity to test a meat thermometer from Instant Read Thermometers. This handy meat thermometer has a large instant read dial that records a previous temperature and works in either Celsius or Fahrenheit temps. This thermometer is meat to be put into the meat when you take it out of the oven (is made of plastic) but it records the temperature very quickly. You can use it for either oven cooking or also for the grill, which my husband loves. To make this garlic lover’s roast beef, you need a large roast, plenty of garlic and a great blend of basil, sage, rosemary and thyme for the crust. The roast is prepared by cutting slits in the meat for the garlic slivers and then coating the whole of the outside with the spices for a nice flavor, then cooked to your desired inside temperature. I served this with roasted root vegetables and garlic mashed potatoes for a delightful and hearty home cooked roast dinner. When I tested the beef with my new thermometer, it read at 135.9º F and the meat really was just medium rare. I was so happy that it was so accurate. Can’t wait to try it on the grill, or rather hubbie can’t wait! I received this meat thermometer for free for an honest review of the product, but I only recommend products that I believe my readers will enjoy. 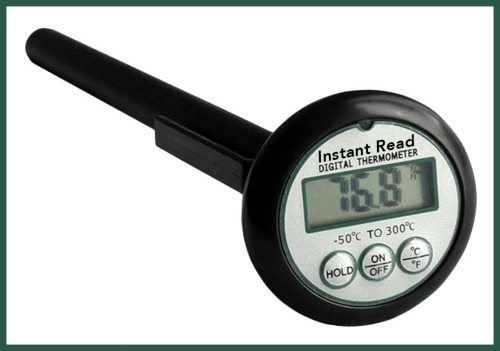 I you would like to try the thermometer, it is on sale right now at Amazon with free shipping if you have Amazon prime. I recently joined Amazon prime and am really glad I did. The membership gives you access to the streaming library for videos, music and the Kindle lending library too, as well as free 2 day shipping on thousands of products on Amazon. Preheat the oven to 350º. Mix together the spices and seasonings. Lightly spray the meat with olive oil and season generously by spreading the salt, pepper and spices over the outside of the roast. I used fresh rosemary , basil, and thyme but dried sage, since it is winter and my sage is not yet growing. Trim all the fat off the meat. Using a sharp knife, pierce the meat with ½ inch deep slits and insert slivers of garlic in each hole, pushing all the way in. Place the roast in a baking dish and put in the oven and cook until the temperature reads 130° for rare, 140° for medium rare, 150° for medium, and 155-160° for well done. Remove the roast from the oven and let it rest 10-20 minutes before you cut it so that the juices will be distributed evenly. Serve with Garlic mashed potatoes, and veggies for a hearty roast dinner.